How did Sons Of Alpha Centauri first form? Can you tell us a bit about your history? Marlon King (Guitars) - Before SOAC, Nick and I were in a grunge band together called Pariah when we were both 15. It was a typical local band of the time, it had a different member line up each year. I was in the band for about 18 months before I ended up leaving to form an Indie band called Passola with friend Michael Osbourne (now drumming with Moose Blood). But it was in Pariah Nick and I performed our first rock gig and we become friends and started playing music together. In 2001, we were both at University and the bands we were in started to fold. It was around then we started talking about starting a long-term musical venture. 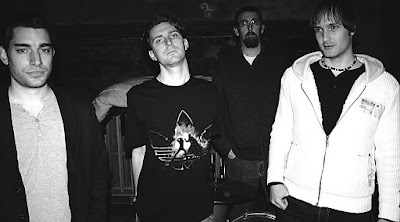 Took us a few years to get a collection of tracks together as Nick was based in Birmingham at the time and me in Canterbury, but by 2004 we had nearly 30 tracks and started to look for other band members so we could start playing live and that's where it all kicked off. You’ve become known for your splits with fellow instrumental band Karma To Burn. How did that collaboration come about? Nick Hannon (Bass) – I bought the first KTB album probably about 20 years ago now and they blew me away man! There was like 10 – 12 of us that used to knock around Sittingbourne listening to music and they became a mainstay on the stereo. We were lucky enough to see them in 2001 on the Almost Heathen tour probably a few months after SOAC formed. Me and Marlon met Will that night at a really inspirational point. Around 2006 I managed to get in contact with Will when he was in Treasure Cat and invited him over to record with SOAC. We formed a side project called ‘Alpha Cat’ and managed to write and record three new tracks. We did a whole record with him called ‘Last Day of Summer’ which included 4 tracks from SOAC and from Treasure Cat. As such once Karma got back together having supported Will and the guys when they were offline were has the idea of doing a 7” and a tour together and it just went from there. You’ve recently released a box set with KTB, which looks great! Can you tell us about that? How did you come up with idea and what does the box include? Nick - So, the first vinyl came out on Kitchen Dweller Records and we were gonna do the second one on SpaceAge & Cheesecake Records. They had printed everything up and paid for the masters but Buzzville Records went pop so that was junk. However, Jürgen at H42 Records stepped in and he was on his first few releases and he took it on. He did an awesome job, so we did another and then for that one we also did it as the first DesertFest vinyl too. Since then, me and Jürgen have worked on the DesertFest series together. After quite a few shows and so many stories we thought about doing a repress with a booklet and then just thought why not put all the vinyl and the collaboration from Last Day of Summer all together with a big book? So we did that. H42 put a bottle opener, postcard, CD, poster, lighter in there too and just went full on. I spoke to Nathan (Limbaugh – original KTB drummer) and he hooked us up with loads of photos from back in the day. Alex von Wieding lead all the design and incorporated the KTB Goataneer, Alpha Cat and concept art. It took about 2 years to put it together and it near enough sold out pre-sale so was well worth it. Respect to everyone for their support and interest always. Aside from your collaborations, your self-titled album was released almost ten years ago now. Are there any plans to record a new album and/or tour? Marlon - No tour booked in yet, but we are now working with H42 Records and Cobraside to release our new album in 2018. Whilst we have done several collaboration releases since our debut, this will officially be our second album. It's been a long time in the making but looking forward to getting it out there. This is a question that I try and ask most bands; what advice would you give to new bands who’re just starting out? Marlon - You can either follow the sheep and try and be big or you can try and be unique and play in the shadows. Maybe it’s not quite that dramatic, but we have certainly found more enjoyment from playing in styles that are not necessarily as accessible to a wide audience but are more meaningful to us as individuals and anyone else that "get" that vibe. All in all though, it really does depend on what your influences are. We have lots between us and we have never locked down SOAC to a specific genre, only enough to form consistency within an album. So my advice would be to play and write music you enjoy rather than music you think others will enjoy. From your connection to DesertFest and from touring in the UK, what current bands could you recommend to fans of the instrumental/stoner genres? Nick – There’s some great new UK bands out there man. Bossk, Desert Storm, Ten Foot Wizard, Boss Keloid, Enos, Bong Cauldron off the top of my nut. All well worth checking out for sure! That said, we don’t really knock about with many other bands to be honest – or at least not UK ones. We used to tour with Bossk back in like 2006 – 2008 but that was about it really! The first six songs of this release span the three splits that both band’s did together. Karma To Burn start things off with Fourteen. KTB is a band that I’ve heard and read a lot about in recent years, but have never crossed paths with. Their stoner-rock instrumental on this first song goes from a meandering bluesy tempo to a more full-on stomp that gets the heart racing. Sons Of Alpha Centauri and first song 65 sounds more goth-like, which is perfect for Halloween; however, that soon dissipates as the guitar takes over. It’s strangely haunting and at times droning in places, though they don’t stray too far from their rock blueprint and exhibit a slight political stance through the samples used. 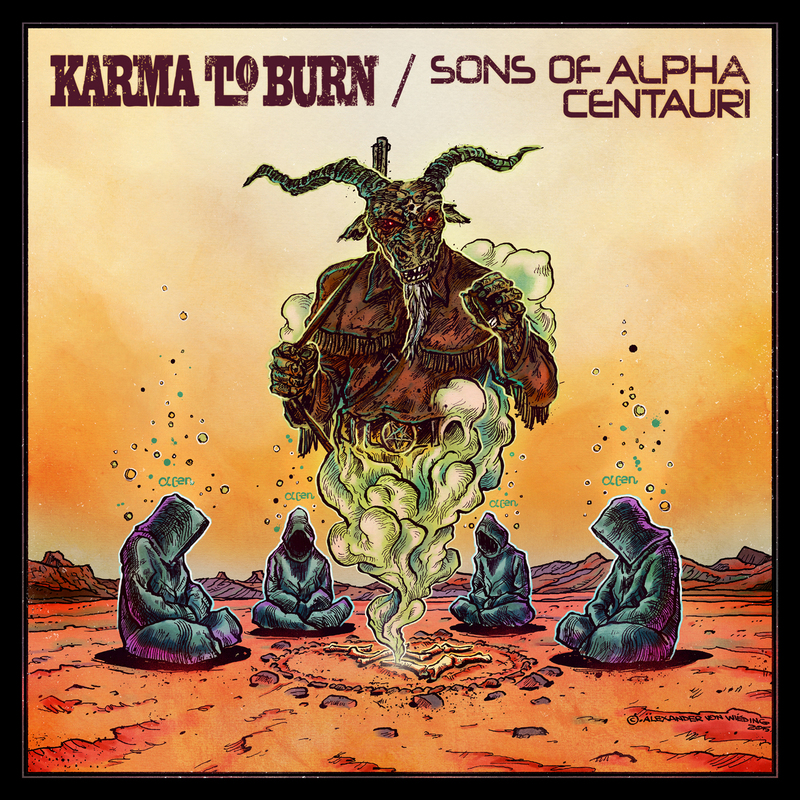 Fifty Five sees Karma To Burn heading in a direction that seems to be more occult, but that’s misleading as the use of electronics and funky bass prove. There’s actually a lot going on musically in these songs and KTB use their’s to exhibit a deft touch when it comes to multiple influences. Their melody is never truly extinguished by their heaviness either. 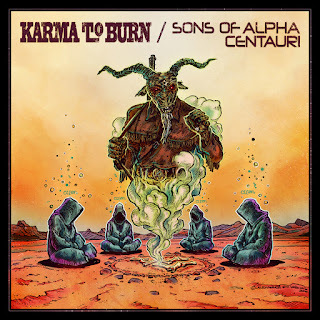 It ends with a looping recoding of a voice mail message left for Sons Of Alpha Centauri by Will from KTB and a hip hop-like outro at the end, which sheds more light into the relationship of the two bands. SOAC follow with 71 and it’s a slow-burner of a song. There’s riffs aplenty on it and a lot more groove. Their sound seems to lean more towards the straightforward rock end of the spectrum, yet they have a knack of making it super catchy and interesting as the song drives on. KTB’s last song from the 7” trilogy is Six and it builds with the kind of post-rock atmosphere that would make many a band happy. While there’s an experimental edge to both bands, KTB’s stands out more. Six is shorter than their previous offerings here but it’s precise and it sounds almost familiar somehow. SOAC’s last song is 66 and it’s an off-kilter rager with some of their own electronic touches thrown in for good measure, adding extra layers. At time it’s more pensive and brooding, which SOAC does pretty well. Over the years I’ve come to appreciate instrumental music a whole lot more than I did when I started this blog and while neither KTB or SOAC are overly technical, they both play great music that’s got personality and warmth to it. The final three songs of this release are from the collaboration Alpha Cat, with which members of both bands recorded the album “Last Day Of Summer” in 2009. The first of the trio, The Flying Dutchman is tuned low and has an air of Motorhead about it and possibly what sounds like a Harmonica. It certainly adds more jazz to the occasion. Fire is altogether slower and harks back to the bands of the collaborators. It grabs the best bits from both KTB and SOAC and turns up the volume. The title-track form the aforementioned collab is one final slab of rock, taken down a path via various other genres. Those other genres may not be easily noticeable amongst the music, but they’re there and Alpha Cat does a great job of weaving them in. In fact, instead of me trying to pigeonhole all three bands on here, just listen for yourselves. This release is definitely worthy of your ears. I believe it is sold out from Karma To Burn and other vendors (but feel free to correct me if I'm wrong).